The 1000th Formula One Grand Prix will get underway in Shanghai for what will be a historic weekend in motorsport. Silverstone hosted the first ever Formula One race in 1950 where Juan Manuel Fangio reigned victorious and etched his name into the history books. Last time out in Bahrain, Charles Leclerc was robbed of his own first race win after a mechanical issue plunged his flying Ferrari from P1 to scraping a third place finish in a troublesome Sunday for the prancing horse’s. The Ferrari’s are touted as outright favourites this weekend and Mercedes will fear that the Chinese Grand Prix could finally see the cars in red kick on in 2019. The Shanghai International Circuit is 5.451km long and is known for its technical, sweeping corners and two very long straights where we expect to see mass overtaking assisted by DRS. There are two DRS zones, the first on the start-finish straight before turn 1 and the second zone before the sharp hairpin at turn 14 where most of the race defining action occurred in 2018’s Grand Prix. The forecast ahead of this weekend shows dry conditions throughout Friday and Saturday, with a small chance of light rain on Sunday which could lead to tricky and unpredictable conditions for teams and drivers. 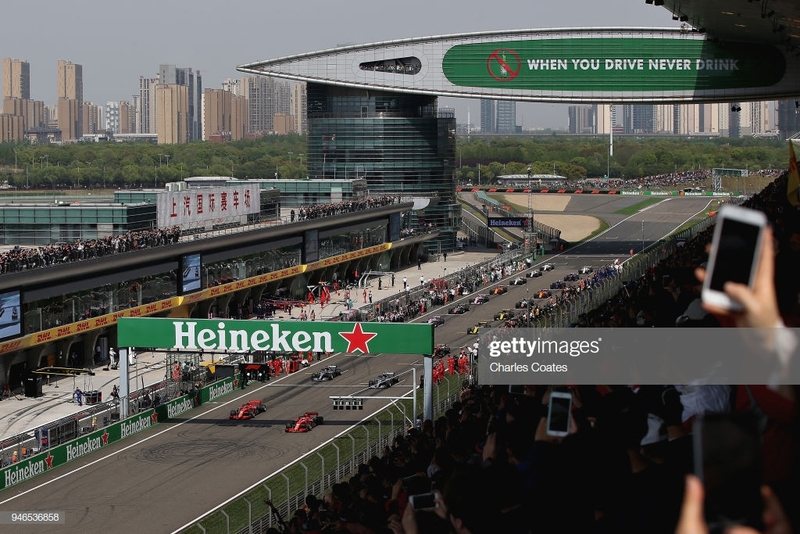 The 2018 Chinese Grand Prix was one that Ferrari were left ruing what could have been after showing immense pace with a front row lockout in qualifying, only to lose out on race-day to an ever-opportunistic Daniel Ricciardo who put on an overtaking masterclass to clinch victory last time out in the Red Bull. Sebastian Vettel was on course to battle for the race win, but a Max Verstappen lunge ended his hopes of even a podium as the Dutchman collided with the Ferrari leaving both drivers facing the wrong direction. Third time lucky for Ferrari? Mercedes top both championships after back to back one-two’s for their drivers Lewis Hamilton and current driver’s championship leader Valterri Bottas. After edging the Ferrari’s in Bahrain due to driver error from Vettel and unfortunate reliability problems for Leclerc, Mercedes took control, but there’s a sense that their good fortune may come to an end in China. Ferrari have ground to make up on their rivals and with superior straight-line speed advantages over Red Bull and Mercedes, China could be the perfect match and Leclerc or Vettel could be set to clinch their first win of the season. In the midfield scrap Ricciardo, Carlos Sainz and Romain Grosjean are all yet to score points in 2019 and will be looking to kick-start their respective seasons this weekend.